Create a comprehensive arts portfolio online via multiple presences. Written for Visual Arts students interested in digitising and publishing a comprehensive record of their artworks online and for the educators helping them. The good news is that your Visual Arts educator has helped you to develop a showcase electronic learning portfolio (e-portfolio): in my research project, its two educators chose Carbonmade, because it met these criteria. The service suits the pedagogical aims in South African Visual Arts well, where a portfolio of 35 images is often more than sufficient to cover the learner's body of work for an end-of-year (matric) exhibition, as well as tertiary education applications. 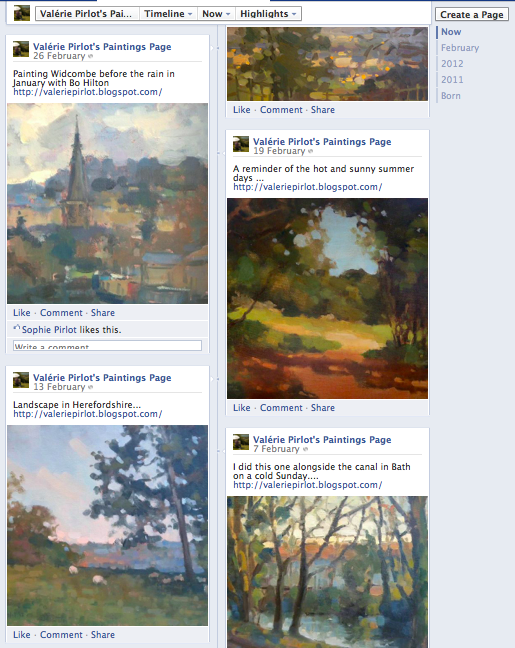 The impressionist painter, Valérie Pirlot, provides links to many sites, which include online presences; her blog, Flickr account and a Facebook page, galleries; the Saatchi and Victoria Art, and an academy; the Royal West of England Academy. 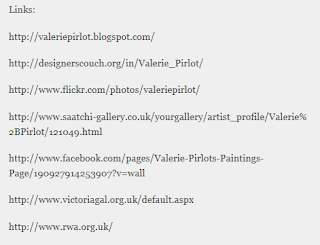 The value of featuring all these links is that viewers can select specific aspects of her work that they are interested in viewing. It is also testifies to her professional status and the galleries and academy she associates with. 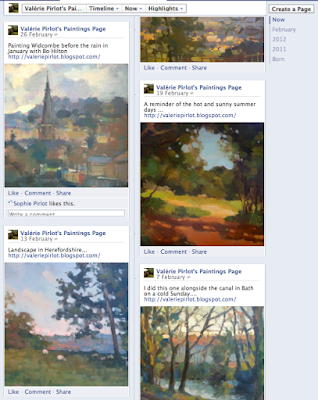 As a learner, you may already have a Facebook account and creating a Facebook page where you upload your artworks should have the benefits of being very convenient, whilst making it easy to share with your Facebook friends. 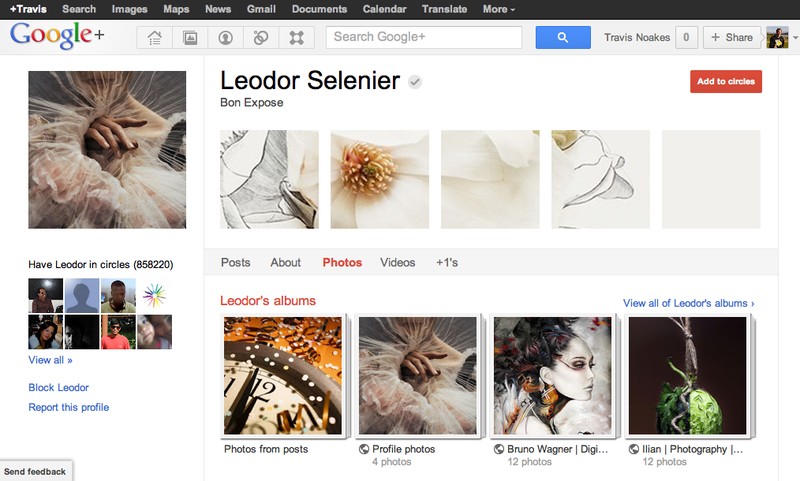 Google account holders users should consider using Google+. If your digitized artworks are well-labelled, this may have the benefit of producing better ranked search engine results on the world's most popular search engine, relative to other services. It is compatible with many mobile phone applications, so easy to share to when using your phone's camera. 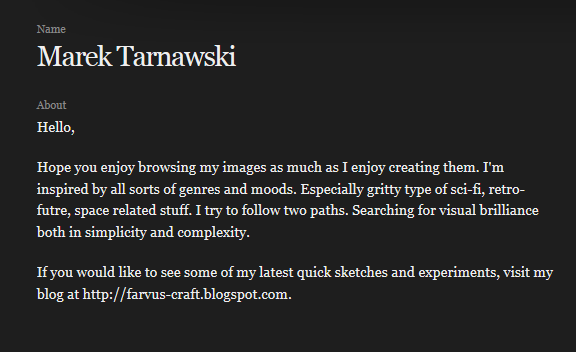 Science fiction concept artist, Marek Tarnawski, provides a link to his blog http://farvus-craft.blogspot.com. 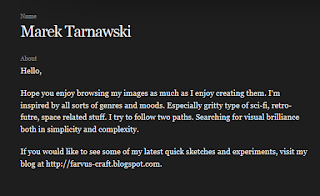 His blog was created with Blogger, but you could consider using WordPress or other popular blogging software. 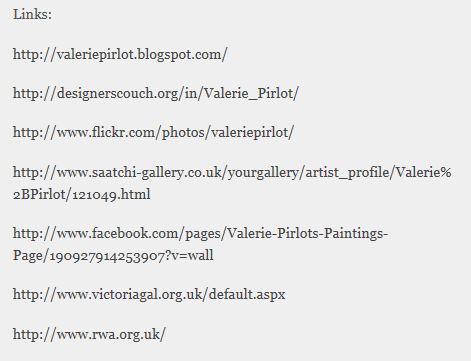 You can create reciprocal links with other blogs via a blogroll. The biggest challenge of using a blog is the importance of writing well and being able to prioritise the time to publish content to it regularly. Before choosing to blog, please read the 1stwebdesigner article "Questions to consider before becoming a blogger". It can help you decide whether blogging is the right medium for you! Carbonmade is just one of many other online portfolio software services focussed on enabling creatives to publish their online portfolios. Each service provides a distinct combination of affordances to cater for the type of creatives they serve; so it's important to define what you may need before selecting one. For example, CGHub promotes itself as "an online community where computer graphics artists share their latest work, tips, and tools, network with friends, search jobs, and more." So, if you want to improve your computer graphics skills, this may be useful to join. 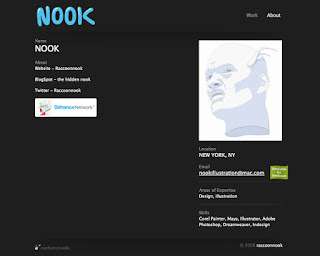 However, if you want to interact with creative professionals outside of computer graphics illustration and want the best visibility of your online portfolio, you should consider using behance.net. I hope that this overview was useful for you. If there is a type of service I have missed, please mention it in the comment box below. Or if you have any other guidance, please do share. Thanks!